We live about 40 minutes away from Seattle, and have learned it can be a fun place for dates, and there are lots of ways to have fun in Seattle on a tight budget. My cousin Jeremie brought his girlfriend Katelyn up to see the city, and Eric and I had to privelege of playing tour guides. Here’s some photos of our day, and a list of cheap/FREE things to do in Seattle. First of all, we parked at Westlake Center. 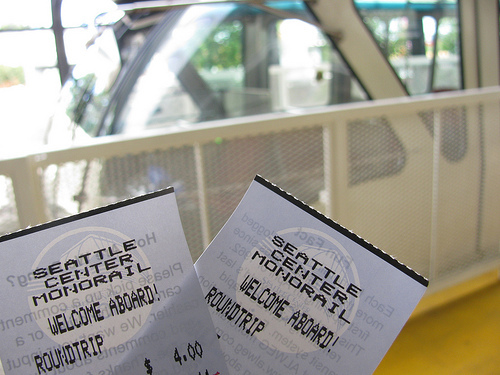 It’s only $7 on the weekends, and we went straight up the elevator to the top floor to catch the monorail. While we waited for the train (and made a bathroom stop after the long drive), we discovered a little food stand called Mobatta. They serve a great variety of crepes, and we had to get some. Eric and I shared a Breakfast Fiesta Crepe and Jeremie got a Banana and Nutella one to share with Katelyn. It just felt like the right food to be eating as we rode the monorail to the City Center. As we watched “Mr. 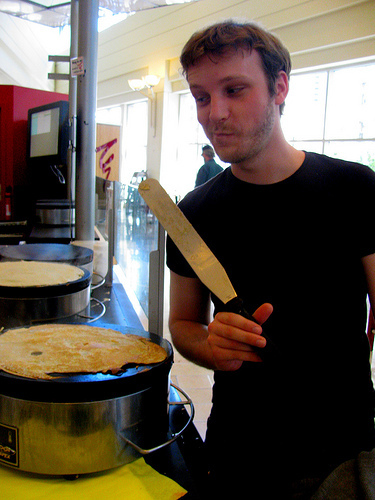 Mobatta” make our crepes, I remarked that the smell made me wish I was in France. He said I shouldn’t wish for that because they’re so rude, at which point we all began laughing hysterically because my cousin Jeremie is French! He then began giving Jeremie quite a hard time, but Jeremie’s used to it. He’s lived in the US for quite a while and has a almost no French accent (unless he wants to). He had Jeremie make a crepe, which was funny because he always makes his in a pan you can swirl, so had a little trouble with the tool they used to spread the batter. But it was fun, and a great start to our day. 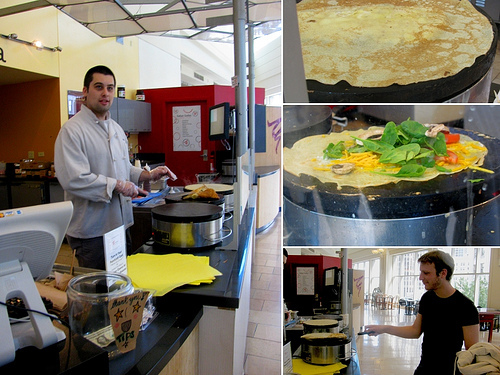 Our breakfast crepe was around $5 and totally worth it, I’d definitely get one again. The monorail is a fun experience, we bought round trip tickets, but with all the walking we ended up doing, should have just gone with one way to save a couple bucks. You can cuddle with your sweetheart, watch the Space Needle as you approach, have the windows get squirted by squirt guns as you sail past an apartment building, watch people get separated when they don’t get on fast enough, and do a lot of great people watching, all for only $2 a person! At Seattle Center, you can browse the gift shops without paying the exorbitant entrance fees to the Space Needle, Sci-Fi museum, or Experience Music Project. 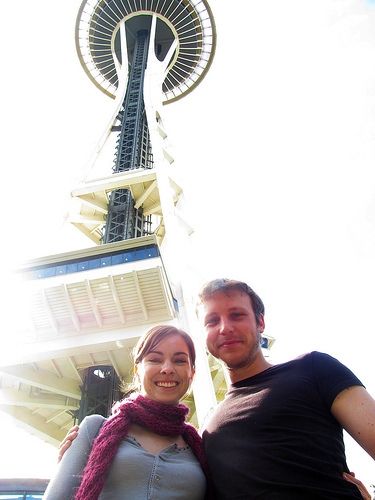 You can also take your picture with the Space Needle! It was crazy sunny, so the exposure was a little tough. Bumbershoot was going on, so we couldn’t explore the fountain and everything like we normally would. But it was still fun. 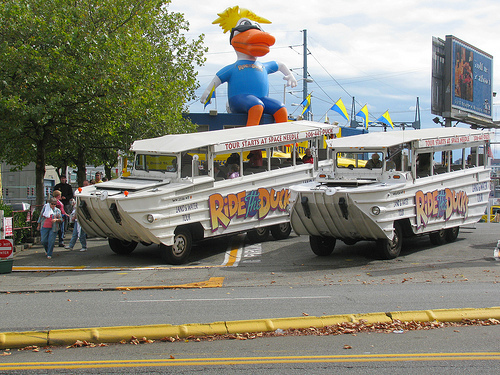 Across the street is the place to “Ride the Ducks”, but rather than paying to take the tour, you can just wave at every Duck full of tourists that drives by. It’s a lot of fun, you can totally tell which bus has fun, energetic drivers, and which ones have everybody bored out of their minds. 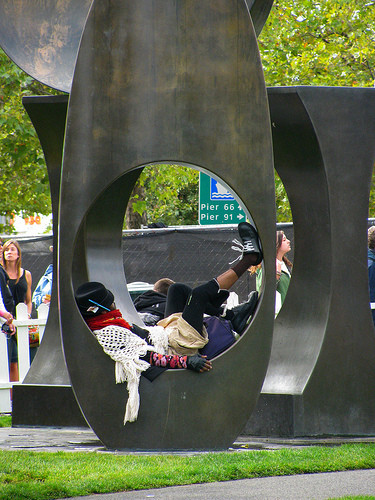 There are also some cool sculptures at Seattle Center, some of which are great for napping. Another great thing in Seattle, is free wi-fi! 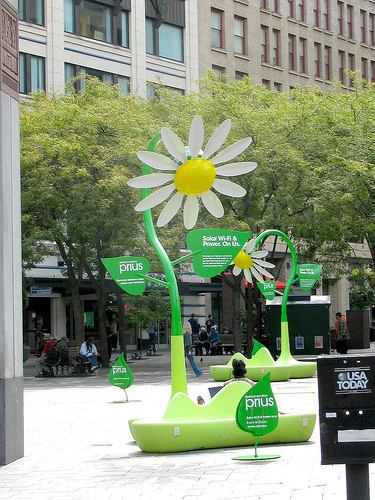 If you need free electricity or a place to plug in you cell phone or laptop, look for some solar power flowers! From Seattle Center we headed for Pike Place Market. There’s tons of shops of course, but you can have a lot of fun without actually having to spend money. 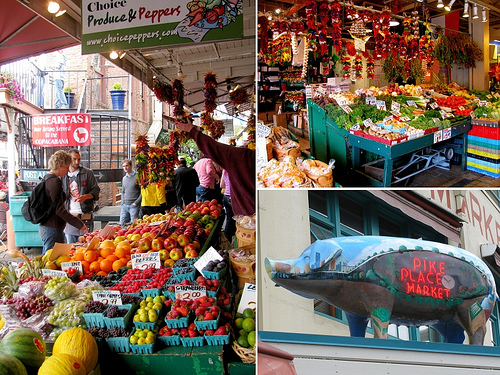 The colors of all the produce are beautiful, there are many street performers, and of course the flying fish. The wind up store is really fun. 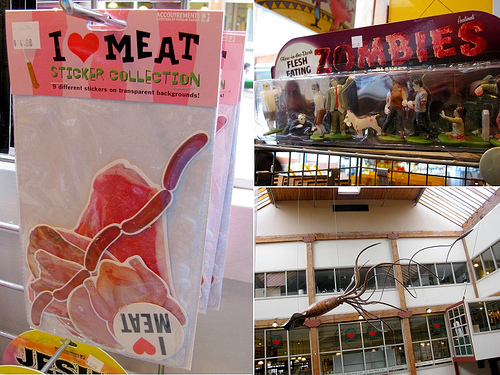 I liked the I Love Meat stickers, but didn’t get them as I thought they could be misinterpreted. I also loved the glow in the dark flesh eating zombies, and the shop gives a great view of the giant squid hanging above the eating area. 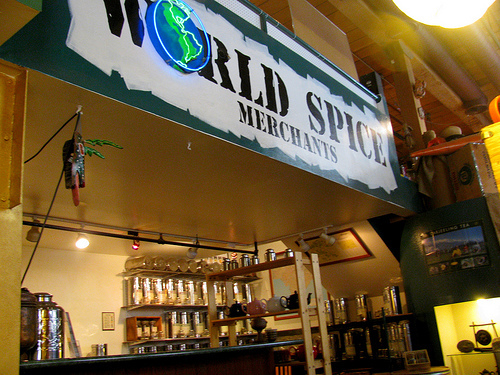 Just below Pike Place Market is the World Spice Merchants. If you like cooking even a little, don’t miss out on this place. 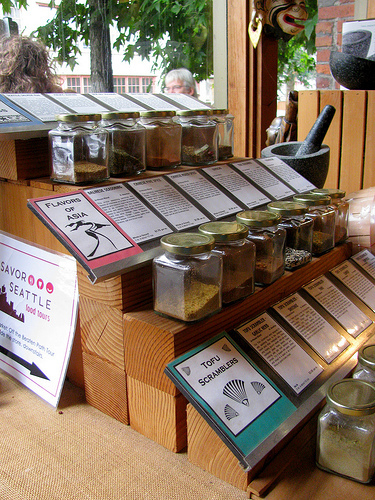 There are tons of spices, rubs, and salts that you buy by the ounce. 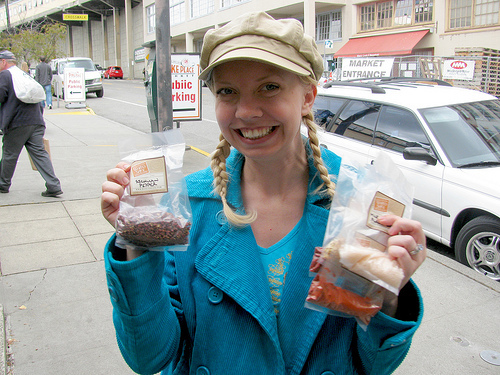 It’s ridiculously affordable (especially compared to a grocery store) and they also have some hard to find spices. …and a comfy couch to wait while they put your order together. 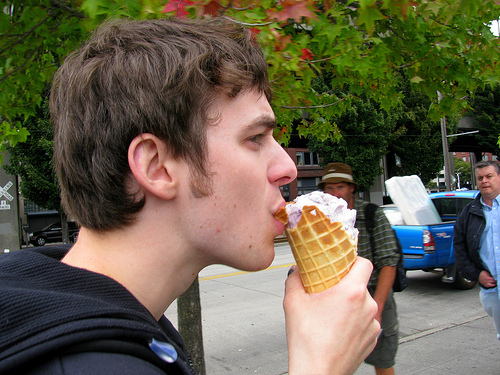 …the best wafflecone ice cream I’ve ever had. Notice everyone staring at Eric, wishing they were eating such deliciousness? This ice cream stand along the waterfront makes their wafflecones right there in front of you, and you can smell them as you walk down the street. We got the Huckleberry Heaven ice cream, oh man! Their servings are huge, a single scoop wafflecone was plenty for Eric and I to split for $4.50. 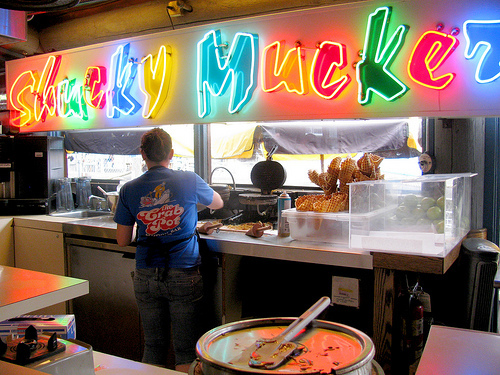 I think it’s at Pier 57, but just look for the place right next to a seafood bar that says fresh waffle cones. There are some really fun shops along the waterfront for browsing. Like Ye Olde Curiousity Shop, and the Pirate’s Plunder. 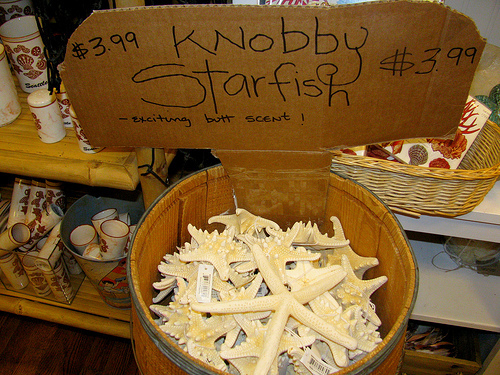 I think these starfish in Pirate’s Plunder were a scent fail! Next we walked about a mile down the waterfront to Downtown Espresso, which is right next to the sculpture park. We love the awesome foam they make, and that the first time we went, the cashier used his own money to buy an orange juice for a homeless guy. So cool! 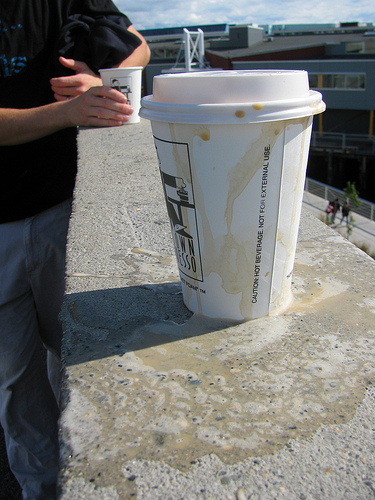 Just make sure that the lid is on your coffee cup right. 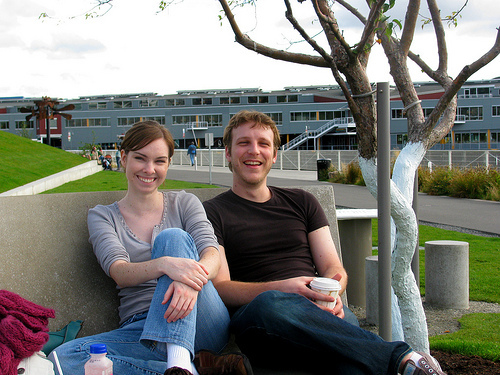 The Love & Loss sculpture is a great place to hang out, talk, and drink your coffee. It’s my favorite sculpture in the park. It was fun that a youth group or college group was doing a photo scavenger hunt, and needed a couple sitting with them on the sculpture, so we posed a few times! The sculpture park is totally free, wahoo! Our final Seattle stop was REI, it’s a pretty amazing outdoor supply store with a rock climbing wall, hiking/biking trails to test out bikes, and a ton of cool stuff to look at. 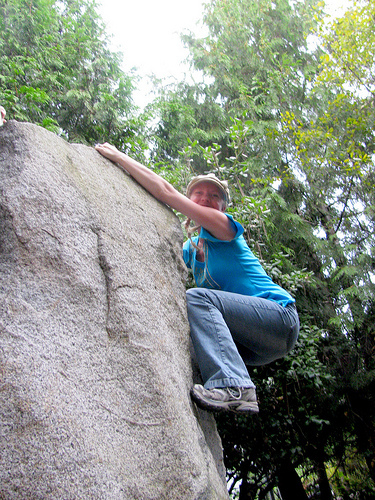 The climbing wall seemed to be closed, so we found some rocks to climb on their hiking trail. 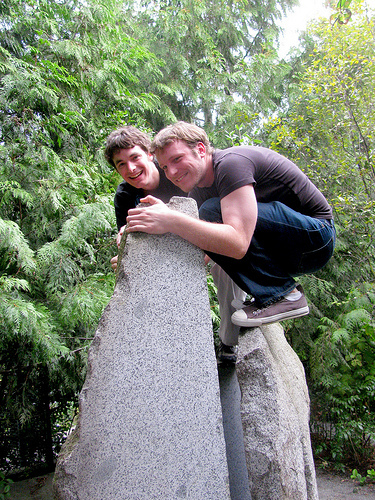 I had a little more trouble getting to the top than the guys. I blame a lower center of gravity! REI also has a great little cafe upstairs where you can get an affordable dinner. We left Seattle though to get our favorite sushi in Bonney Lake! 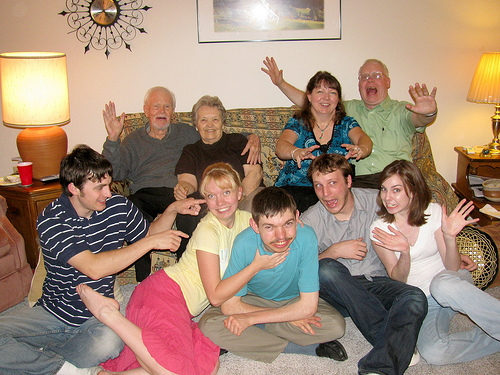 Finally, I just have to include a photo of us hanging out with my adorable grandparents. We’re such a bunch of goofs! Here’s the total cost for a day in Seattle for the two of us (even cheaper if you double date and split parking costs!). By doing a lot of free things, you can save a ton of money. Wow. That is cheap. hehe… sounds like a fun time. I’d love to visit Seattle one day. looks like you had a fun-fulled (and inexpensive) day! i’ve gotta visit seattle one day. 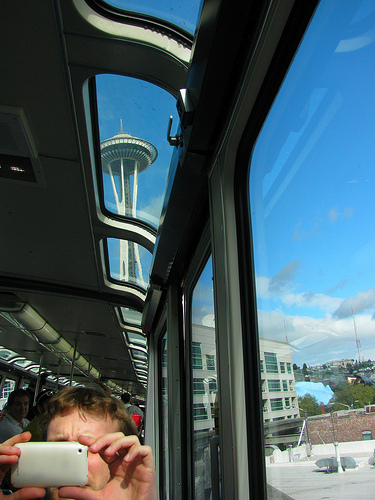 I am curious as to even more of the fun things there are to do in Seattle. I am going with my gf in April 2013 from New Haven, CT and hope we can find a lot of fun (affordable) things to do out there….anyone have some suggestions on how to really have a good time? I’ve been wanting to go to Seattle for a VERY long time. I know several ppl who went and LOVED it…I want to see for myself, so please tell me more if you can!! Pike Place Market. not Pike’s.